Understanding enolate reactions is a critical component to advanced organic chemistry reactions. Taught at the orgo 2 level, the enolate ion provides a very useful method of creating new carbon to carbon bonds starting alpha (next to) the carbonyl carbon. Since this is a somewhat tricky topic, the focus on this series is to first TEACH you the logic behind these reactions, then show you SHORTCUTS on how to QUICKLY come up with products. 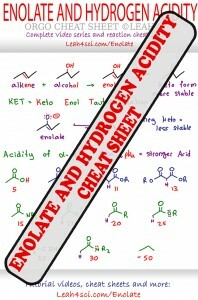 Be sure to see my Enolate Reactions and pKA Cheat Sheet! Think you understand the enolate anion? Start here! 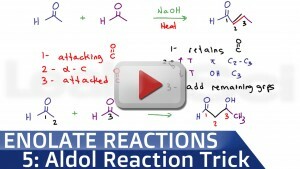 This video takes you through the enolate anion formation, reactivity and stability. 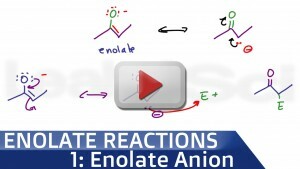 Understanding the enolate anion will help you make sense of the upcoming reactions. Included is a breakdown of common enolate pKa along with a logical stability ranking to help you avoid pKa memorizations. Halogens make great leaving groups for substitution and elimination reactions. This allows you to add/change the structure of your starting molecule. Alpha Halogenation is a useful reaction for introducing reactivity on a molecule by adding in that versatile leaving group. 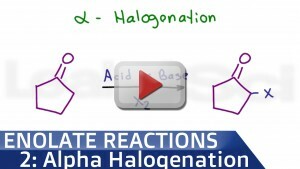 This video shows you the step by step mechanism for alpha halogenation on an aldehyde or ketone. The haloform reaction is an old lab technique used to identify a methyl ketone. This includes the chloroform, bromoform and iodoform reaction. The latter being most useful given the solid yellow precipitate. 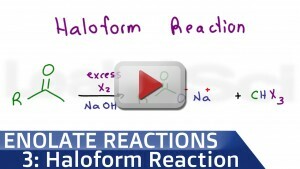 This video shows you the step by step mechanism including the potentially confusing selectivity of the halogenation product. The Aldol addition or condensation is a great weapon to have in your synthesis and retrosynthesis arsenal. This reaction helps you form a carbon to carbon bond making it useful for growing your carbon chain. 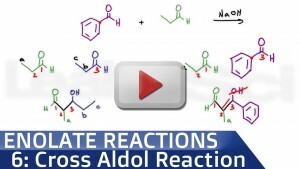 This video takes you through the step by step mechanism for aldol reactions carried out under acidic or basic conditions, at high and low temperatures. Aldol addition/condensation is a great reaction to learn, but it takes way to long to come up with products the ‘traditional’ way. This video shows you my 1-2-3 trick for quickly figuring out products without working through the tedious mechanism. You’ll also learn how to quickly identify the starting molecules when presented with the products of a condensation reaction. Aldol addition and condensation reactions can be carried out using aldehydes or ketones. The reaction isn’t limited to a SINGLE starting molecule. This video shows you how to come up with up to 4 unique products when carrying out this reaction using a mix of 2 different starting aldehydes, ketones, or both. You’ll also learn how to apply the 1-2-3 shortcut for coming up with products FAST! 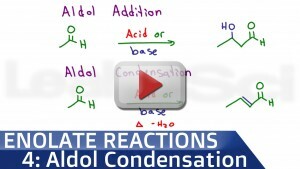 Aldol addition/condensation reactions require a mix of 2 aldehydes or ketones, but they don’t have to be SEPARATE molecules. 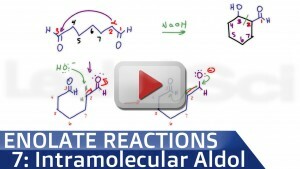 This video shows you the reaction, mechanism, AND shortcut for coming up with a product when the 2 reactive groups exist on the very same molecule for an internal or intramolecular condensation reaction. Claisen condensation is a fun reaction used to form a beta keto ester when reacting esters in a strong base. 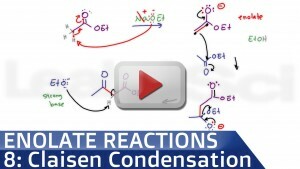 This video shows you the step by step reaction mechanism including why the reaction is reversible only till the final step. 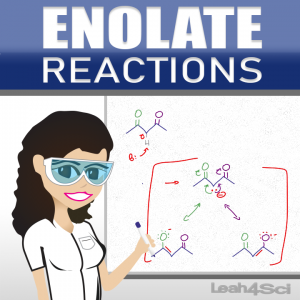 Don’t forget your own printable Enolate Reactions and pKA Cheat Sheet!